Not much news here: construction spending continues to be quite weak. Residential construction has been relatively flat and very low for over two years now. 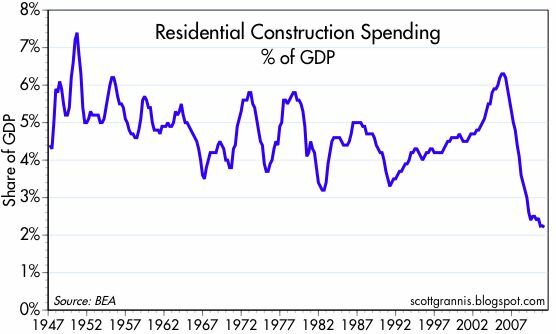 As the chart below shows, residential construction has now reached its smallest level ever relative to the overall economy. 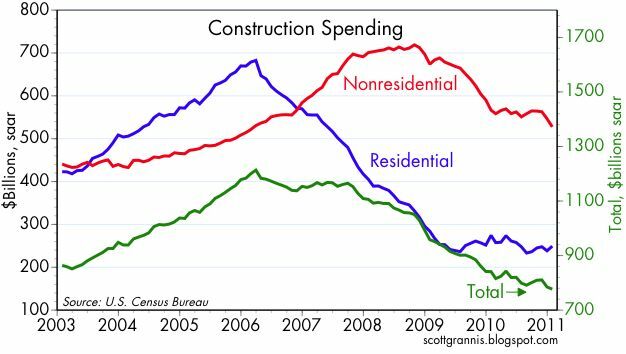 Nonresidential construction last year looked to be stabilizing, but in recent months has been declining again. Weak? How about "nearly dead"? Real estate needs a huge shot in the arm. Lately, there are signs of a pick up. Still, the sector is a fire sale, in the deflation mode. The are whiffs of Japan-itis in the air. There are loads of vacant office buildings all over Orange County. This is what happens when the Federal Reserve tinkers incorrectly with incentives to save and invest. The next bust should be spectacular. True story: You can rent class A space today in downtown Los Angeles for $3 a sf--the same price as in 1980! 31 years years, and no inflation. Indeed, rents are going down now, what with 18 percent vacancy rate. Unwind Freddy and Fanny. It will make the bottom for housing and construction.